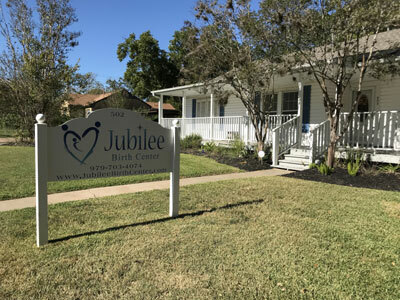 Jubilee Birth Center has come to be open due to the interest and support of many clients in the area who have asked for and wished for a birth center to be open in the Brazos Valley area. In God’s perfect timing, He has allowed for the right realtor to find the right property for us to feel compelled to open the birth center. The name Jubilee came from many hours of trying to come up with the right name for the birth center. Jubilee means a joyful celebration! It also refers to a rest or release. These things can be interpreted in many ways, but in the end it was the name that we felt was chosen for the birth center. We are staffed with two midwives, Toni Kimpel and Shalynn Fifield, and two students Riley Dawson and Cheryl Amelang. A woman can come to the birth center for all prenatal care including lab work. You get to know your midwife and become familiar with the birth center by having all your appointments there. If you want a home birth that is still an option for you. Labor at the birth center will be more like a homebirth in that the setting is home like, but all the supplies are provided for you. You only need to come in labor with your own personal items like you would bring to the hospital. We have clients coming from not only Brazos County, but Burleson, Grimes, Lee, Washington, and other surrounding counties. For women who have had to drive to Nativiti in the Woodlands or Austin Area Birth Center, they can now save the drive for prenatal care and especially that drive in labor!